RC Universe has collaborated with ROC Battery to provide a Fall contest for our forum members. This month we are offering 3 prizes to the winners of our photo caption contest, so submit your caption before somebody else comes up with it first and snags the prize. On 10/31/12 a winner will be selected by the RCUnivrese team. The first place winner will receive a $150 gift card to ROC Batteries, second place will receive a $30 gift card and third place wins a $15 dollar gift card! All you have to do is submit a caption to the picture provided by either posting on this thread or submitting via PM to username IB_StefT to potentially win! Please see terms and conditions for more details. 1. Eligibility: RCUniverse.com and RCTech.net’s ROC Batteries End of Summer Sweepstakes (the “Sweepstakes&rdquo is open only to legal residents of the 50 United States and the District of Columbia over the age of 18 with access to the Internet and a valid email account. All employees of Internet Brands, Inc. (“Sponsor&rdquo , all employees of the named Sweepstakes Partner, all associated agencies and their respective affiliates, licensees or agents (collectively, “Sweepstakes Entities&rdquo , and their immediate family members (spouse, parent, child, sibling and their respective spouses) and those living in the same household of each (whether related or not), are ineligible to participate in the Sweepstakes. All applicable federal, state and local laws and regulations apply. Void where prohibited or restricted by law. Entry in the Sweepstakes constitutes your full and unconditional acceptance of these Official Rules. NO PURCHASE NECESSARY. A PURCHASE WILL NOT IMPROVE YOUR CHANCES OF WINNING. 2. Sweepstakes Period: Unless specified otherwise, the Sweepstakes entry period begins when the Sweepstakes is posted on RCUniverse.com and RCTech.net and ends at 5:00 p.m. (Pacific time) on the Sweepstakes’ specified end date (the “Sweepstakes Period&rdquo . Winners will be selected from entries properly submitted and timely received during the Sweepstakes Period. a. Forum Post. Visit RCUniverse.com or RCTech.net and accurately complete and submit an online forum post in accordance with the on-screen instructions. For RCUniverse.com or RCTech.net forum entries, you must be a registered user of the respective website to participate. Limit one entry per registered user. Multiple posts on one forum thread will be deemed one entry. Limit one entry per person. All entries become the property of Sponsor and will not be acknowledged or returned. Incomplete entries are void. Proof of submission is not proof of receipt. Multiple entries and mechanically reproduced copies are void. 4. Prizes: Three (3) prizes will be awarded. Prizes will not be replaced if lost or stolen, are not transferable and are not redeemable for cash. Sponsor reserves the right to substitute a prize of equal or greater value if entire prize(s) or a portion of the advertised prize(s) is unavailable for any reason. The reporting and payment of any tax liabilities (federal, state and local) incurred by the winners as a result of the Sweepstakes are the sole responsibility of the winners. Any and all guarantees and warranties for merchandise prizes are subject to the manufacturer's terms and conditions, and the winners agree to look solely to such manufacturers for any such warranty or guarantee claim. 5. Selection of Sweepstakes Winners/Odds: The winners will be selected in a random drawing to be held on or within 5 business days after the specified end date of the Sweepstakes Period. The winners will be selected from all eligible entries received during the Sweepstakes Period. Odds of winning will depend on the number of eligible entries received during the Sweepstakes Period. The winners will be notified via email to the email address submitted with the winner’s entry, within five (5) business days after the drawing. The drawing will be conducted by Sponsor, the judge of the Sweepstakes, whose decisions on all matters relating to the Sweepstakes are final and binding. In the event that a winner(s) is disqualified for any reason, Sponsor may, in its sole discretion, award the applicable prize to an alternate winner(s) selected at random. Any return of prize notification or prize email as undeliverable will result in forfeiture of any prize and an alternate winner(s) may, at Sponsor's discretion, be randomly selected. 6. Publicity: As a condition of entry into the Sweepstakes, except where prohibited by law, each entrant and each winner by accepting a prize grants to Sponsor (and its affiliates, legal representatives, assigns and licensees), all right, title and interest in to publicize, broadcast, display and/or otherwise use the Sweepstakes entrant’s name, city, state, and biographical material (collectively, “Licensed Rights&rdquo in any media for advertising and publicity purposes, without additional review, compensation, permission or approval of the winner. The winners may be required to execute and return an Affidavit of Eligibility/Liability and Publicity Release within five (5) business days of attempted notification or the winner(s) may be disqualified and an alternate winner selected. 8. Participants’ Obligations: By participating in the Sweepstakes, you agree to be bound by these Official Rules and the decisions of Sponsor. By accepting the prizes, the winners agree to release and hold Sweepstakes Entities and their agents and affiliates harmless from and against any and all losses, damages, rights, claims, actions and liabilities of any kind in connection with the Sweepstakes or receipt or redemption of the prizes. The winners assume all liability for any injury, death, or damage caused, or allegedly caused, by participating in the Sweepstakes or use or redemption of the prizes. Any disputes that may arise hereunder shall be governed in all respects by the laws of the State of California without regard to the conflicts of laws principles of any jurisdiction. Venue with respect to any such disputes shall be had in the state and federal courts of the State of California. 9. Winners’ List: For a list of the Sweepstakes winners, send a self-addressed stamped envelope to: Internet Brands, Inc., Attn: RCUniverse.com and RCTech.net Winners’ List, 909 North Sepulveda Boulevard, 11th Floor, El Segundo, CA 90245. Requests for winners’ lists must be received within thirty (30) days after the end of the Sweepstakes Period. "This is the last time I let HER pick out a new neck-strap"
(baby) Hmmmm....I wonder what THIS switch does?! I don’t care how much you pray to the Heavens above daddy ... that thing will never be able to change my stinky diaper! That's right, add a little up. Little more, there you go! 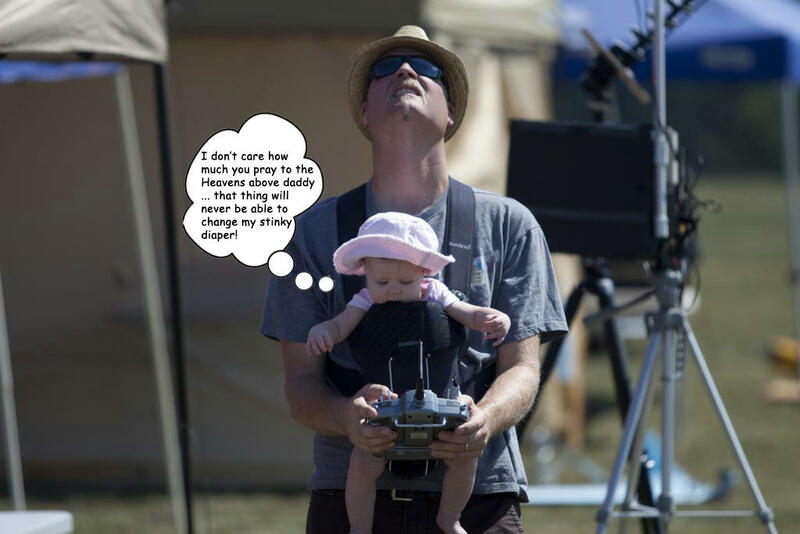 See Dad, I told you that you could learn to fly RC too! 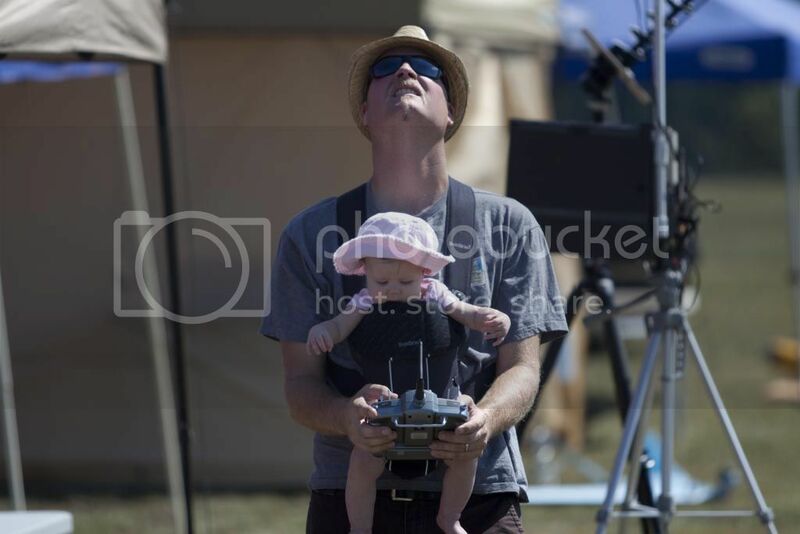 Papa, you need to land NOW because the battery thingy is in the red. "Dad is my co-pilot. That's the way I roll, baby!" Who needs a buddy box when you got a buddy strap? Don't make me land this plane! [size=1][/font]Gimme that transmitter - I'll show you how to do an outside loop! Oh yeah....I take my hands off it for a second... and look what you've done! I think you would fly a tighter line if you used your thumb and index finger, like I do. After you try it a few times you will realize its so simple a baby can do it. Baby: "So that's how you do a rolling circle..."
Hmmm....I don't think that thing will fit where mommy told him to put it! (Baby) I can't quite reach... Is it my turn yet? Aaaaaaah, Dad! I think Mom put your good batteries in my baby monitor! But you told mom we were going to the zoo! Ummm dad? That's not you up there...you're still on the ground in front of us! Fly well Daddy. I'll be your check pilottoday. Don't worry Daddy I got your back. And Mommy said it was this big.